Buy Box is the term that Amazon uses to refer to the offer price which is centrally featured on Amazon's product page. For instance, in the image below, the buy box price is $699.99. There are 31 other offers available for the product from other sellers (see the bottom right of the image) which you can see by clicking on the 31 new link. You'll find many 3rd party and used offers at that link as well. 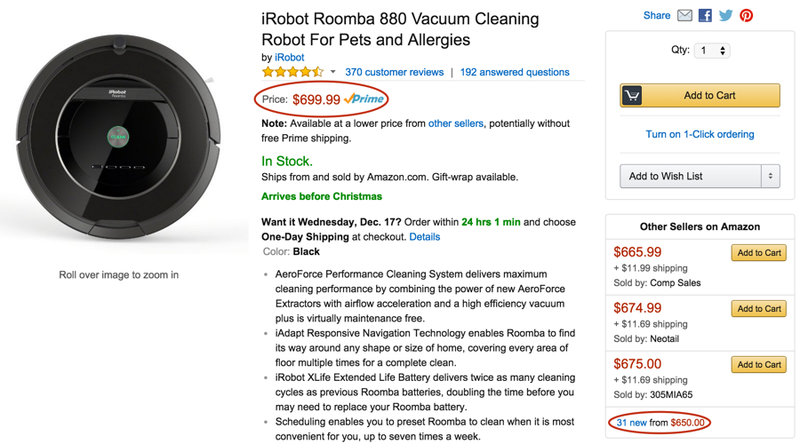 Amazon has chosen to feature the $699.99 offer prominently most likely because it is the cheapest Prime eligible offer. Camelcamelcamel now tries to guess the Buy Box price on our product pages as shown in the image below. Since Amazon does not tell us which offer it's featuring in the Buy Box, we have to infer it from other product properties. As such, there are probably a few instances where we will guess the Buy Box price incorrectly. Please consider the Buy Box guess on camelcamelcamel as our best attempt to help you figure out which offer price is the one you'll see featured on the Amazon page. If you think we've made a mistake, please contact us at support@camelcamelcamel.com.